The luxury villas in Tuscany range from magnificent historic estates to charming farmhouses in the picturesque countryside. These villas offer modernized accommodation and amenities in beautiful surroundings with a level of service that the discerning traveler expects. There are deluxe features such as bedrooms with private bathrooms, multiple living spaces, swimming pools, outdoor dining areas and even staff to assist you during your stay. 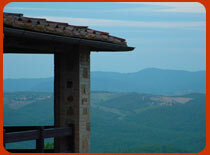 These houses provide a comfortable, convenient base during your vacation in Tuscany. With the convenience of all the area sights and the peaceful settings, many guests return each year to their Tuscan retreat. Several of these estates are perfect locations for corporate meetings.